MAIN line registered GWR Pannier tanks Nos. 9466 and No. 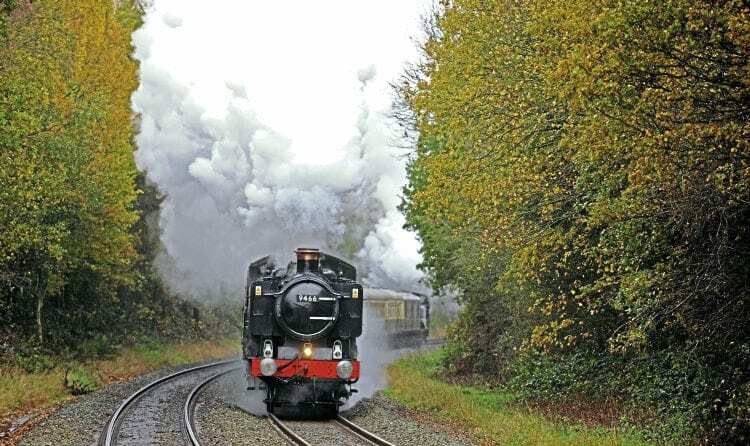 9600 joined forces to haul Vintage Trains’ ‘Valley Rambler’ from Tyseley to Bridgnorth via Stratford-upon-Avon on November 11. The nine-coach train, including Pullman Cars, was top-and-tailed on the Stratford to Kidderminster leg to permit easier access to the SVR, with No. 9466 leading and No. 9600 providing assistance. The two 0-6-0PTs double-headed the return trip, bunker first. No further trains are currently scheduled for the ‘Dynamic Duo’, but more Pannier-hauled trains are expected to be announced in 2018. Vintage Trains has confirmed the first two main line outings for its legendary ‘Castle’ No. 7029 Clun Castle.